This beautiful faucet is made of the highest quality components and conforms with the 2014 Federal Reduction of Lead Drinking Water Act. The Chrome finish and European style give it a very attractive appearance. The price is extremely affordable and the quality is beyond reproach. There are no plastic components and can withstand up to 120 PSI. The dependable ceramic disc valve mechanism is guaranteed to perform and carries a 3 year leak free warranty. This faucet is built to last and is "Lead Free". All materials are certified to NSF/ANSI 61-G & NSF/ANSI 372. This faucet is equipped with an Air Gap feature. Reverse osmosis filtration technology produces purified water by rejecting dissolved minerals by forcing the feed water through a semi permeable membrane. To preserve the integrity of the membrane water is constantly flushing over the membrane surface to carry the mineral to drain. Thus a drain line needs to be accessed. When a reverse osmosis drinking water system is installed under the kitchen sink an air gap faucet needs to be employed so cross contamination of the potable water and waste water does not occur. 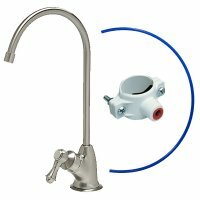 The air gap feature allows the waste stream to be carried up to the faucet base by a 1/4" tube. Here the waste stream spills to a small reservoir built into the faucet base. This water is carried to the waste pipe which services the kitchen sink via a 3/8" tube. Located in the faucet base is a spill vent that allows the water to drain freely and it also prohibits the waste water from back flowing in a way that could contaminant the potable water. If the 3/8" drain ever where to get plugged the waste stream would spill out the vent hole and not travel back toward the potable water. This feature allows reverse osmosis systems that are installed under kitchen sinks to be in plumbing code compliance. We include a 3/8" drain clamp because they are far superior to the 1/4" clamps many reverse osmosis manufacturers furnish with their systems. We also include a 24" section of 1/4" tube and a 24" section of 3/8" tube to make the installation easy and without hassle. Installation instructions are conveniently printed on the exterior of faucet packaging. 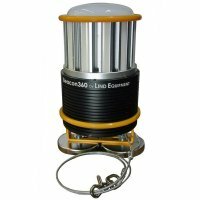 The minimum mounting hole required is 1 1/4" diameter. The maximum hole diameter covered by the escutcheon plate is 1 5/8".